← Lauv adds second show in Singapore! We are just less than a month away from Christmas and what better way to celebrate Christmas than with our homegrown band, The Sam Willows! 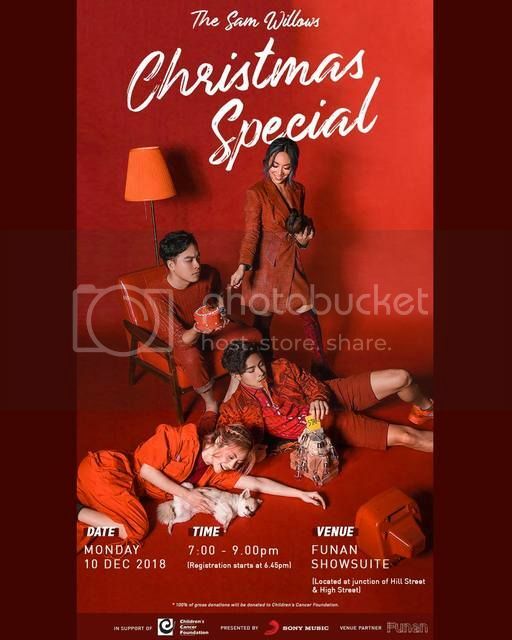 In the spirit of giving, the band recently announced a special one-night only exclusive ‘Christmas Special’ show on 10 December 2018 in support of the Children’s Cancer Foundation (CCF) and in partnership with Funan. The ‘Special Show’ aims to create awareness on childhood cancer as well as to raise funds for CCF. Attendees to the show will be able to make voluntary donations, where 100% of the donations will be donated to CCF. Apart from the ‘Special Show’, the band also collaborated with CCF benefiaciary, Shafikha. Shafikha was diagnosed with High Grade Glioma (brain tumour) in 2017. She dreams to be a singer and a YouTuber in the hopes of spread happiness and bringing hope to those who are in a similar situation by creating a song. Her dream was fulfilled when she got to work with The Sam Willows to produce her own self-written song, Why Me?. The music video was produced as a gift of love that Shafikha hopes to leave behind for her family. I had tears in my eyes watching it and hearing the lyrics. At the tender age of 16 years old, she has to bear the burden of all this while, rightfully, she should be enjoying her teenage years. It is awe-inspiring to see how she transformed her experience by penning it into a song. What a talent! Support Shafikha by listening to her song and also by donating to CCF. With your donation, it can help other children just like Shafikha. If you would like to score invites to the show, head over to the the band’s social media pages! See you there!